A few weeks ago, I explored the a Downtown Vacancy Report prepared for Lowell’s City Council by the Department of Planning and Development (DPD) and compared it to a similar report issued one year ago. The council discussed the report at their next meeting, praising its comprehensiveness while lamenting that some landlords are less aggressive at marketing their property than others. However, it raised questions for me: Why was the amount of commercial space shrinking? Are rents comparable to other cities? What are the factors that are influencing businesses to close? I reached out to the City’s Economic Development Officer, and she was incredibly generous with her time to discuss these and other issues related to the Downtown. What’s the source for the information? The Lowell Sun recently reported that the report was a result of “a recent study commissioned by the city”, but city staff actually continuously update the City’s commercial property database. For the total number of square feet of commercial and residential space, the DPD uses the assessor’s database—the same database that powers the City’s public map app. Example page from Site Finder Report. Lowell produces reports tailored to businesses’ needs. DPD uses a variety of sources to track the tenants of each property. For most of the larger properties, they can find information with their subscription to CoStar, a company that communicates with real estate brokers and property owners across the US daily to provide up-to-date information to real estate professionals and urban planners. Smaller properties are more difficult to track. For those, the city keeps in constant contact with the property owners or the real estate brokers who work with those owners. The City feeds all of this information into a database application called SiteFinder. That way, they can give reports of many available spaces to individuals looking to start or expand businesses. Some cities, such as Somerville, make this information available online. However, DPD would rather individuals contact the City for the information, so that they can begin a personalized conversation and better determine the needs of the individual business and offer appropriate assistance programs. To prepare a Downtown Vacancy Report, they just need to double-check their records are up-to-date, use the information they already have, and write notes on key properties. Why did the total commercial Square Feet shrink? Vacancy is only part of the picture, and average rents are another important part. The City shared CoStar reports about downtown Lowell and surrounding communities. *Real estate professionals categorize office space into three classes. Class C is the lowest, which may be in run-down buildings, in less-desirable areas, and/or need renovation for modern use. Average rents must be taken with a grain of salt: many smaller properties offer negotiable rents, and some rents include utilities or common space, while others don’t. With those caveats in mind, Downtown Lowell’s retail rent range appears comparable to the area, slightly lower than the Greater Boston average but in-line with Southern New Hampshire. However, downtown offices appear to command low rents, and this may be one clear reason why commercial-to-residential conversions happen more quickly than new office development. For example, new Boott Mills apartments can provide nearly $24.00 PSF of revenue annually. Low rents might tell a story of a struggling downtown, with property owners only making enough to pay taxes. However, high rents and high vacancy may represent landlords overvaluing their properties. That doesn’t appear to be the case with downtown as a whole, but it might be true for certain properties, with some landlords seeking rents that are comparable to Class A or B space even though they don’t have basic amenities such as internet access. What does DPD currently do to help businesses? The Merrimack Valley Small Business Center provides microloans, workshops, and mentorship programs to small businesses in Lowell, Lawrence, and other towns. They also run a community kitchen and the outdoor summer Farmer’s Market. They have helped many small businesses in the downtown area. The Sign and Façade Program grew out of the City Manager’s Neighborhood Impact Initiative, which ran from 2009-2013 under City Manager Bernie Lynch. The former program concentrated on a different neighborhood each year, targeting sidewalk, security, façade, and other improvements in a coordinated way. The funding pool is now being used partially for a grant of up to $2,000 for any eligible business throughout the City to improve its appearance, including paint, lighting, awnings, or signage. These, along with communication with brokers, landowners, and prospective tenants, are largely the same programs that were around during the last downtown improvement report. Pop-ups are stores that might be only open for a weekend or a season, filling a vacant storefront temporarily, either as an expansion of an existing business or a whole new business. Some pop-ups are successful, and evolve into year-long businesses, while others fill a specific niche at a specific time. Either way, they create a sense of liveliness and draw an audience that helps neighboring, permanent businesses. I have been told that many landlords require a two-to-three year lease, wanting to lock-in stability rather than deal with the increased workload and uncertainty of shorter terms. This is common, as short-term leases are relatively new: an article about Washington DC might as well be written about Lowell, even with the City interested in promoting the concept. What may be needed is a legal framework and model lease to make it easier for reluctant landlords. DPD is working closely with COOL to make it possible for more artists to display public art or other installations in vacant stores. However, they’ve been encountering difficulty when property owners cite insurance and liability concerns. During the City of Lights parade, artwork was displayed in some windows, and one of the pieces disappeared, either stolen or accidentally thrown away. These incidents create even more doubt that an arrangement is possible without clear legal terms. Notably, we can also build on many success stories. For example, a local artist and a property owner worked together to showcase a colorful display about Lowell’s First Thursdays 2015. A primary concern raised by some of the dozens who attended the September Downtown Business Summit (see sidebar) was the need for more lighting downtown. I was told that the City hoped to add brighter bulbs for the Victorian lamps downtown, but other interesting ideas have been raised. The DPD may look for funding to help property owners install architectural lights that would brighten downtown and show off downtown’s greatest physical asset: its architecture. Additionally, there may be ways to encourage downtown businesses to leave storefront lights on during the night to showcase their window displays. This may involve education or finding funding for low-cost LEDs to reduce electricity bills. Finally, another issue of concern is that property owners’ options for securing low-interest loans, grants, or other assistance for renovations are limited. Businesses looking to grow or expand can often obtain state financing from sources such as MassDevelopment, and developers creating housing can find funding from historic and low income tax credits. However, property owners wishing to renovate offices with elevators, improved wiring and heating, internet connections, or other work without a tenant lined up have no such options. It’s a catch-22, as a tenant could secure financing, but few tenants are interested in considering old buildings without renovations. It may be another reason we see more apartment conversions than office development. DPD is continuously looking for ways to help property owners finance renovations to attract new office tenants. However, it’s clear that speculative renovation carries its own risks. Trinity Financial renovated 110 Canal Street for $14 million, finishing in spring 2013, but it still took until spring of 2014 to officially secure UMass Lowell’s Innovation Hub and M2D2 Expansion as a tenant for two of the four floors, and UMass Lowell won’t finish the interior improvements and move in until at least summer 2015. Still, it’s unclear if UMass Lowell would have selected that site for expansion without those initial improvements made two years ago. Is Downtown in a Good Place? Their discussion focused largely on “problem” landlords. Councilor Kennedy said, “I know it’s difficult, because we don’t own that property, so it’s not like we can do anything we want. It’s really up to the landlords to determine just how aggressive they’ll be renting out their property, but I imagine everybody would like to be at full occupancy if they could,” and others echoed his sentiments. City Manager Murphy agreed. He relayed a story of the City lining up a tenant for a large storefront downtown, but the property owner declined, planning on selling the building and believing that the property would be more valuable empty than with a tenant. Councilor Kennedy suggested engaging a retail expert or commercial broker to provide suggestions, and the City Manager said that the City would provide a report on the efficacy of doing such. It is still unclear why downtown seems to have been hit particularly hard in the last year, with several long-term tenants closing shop. The Sun reported that Giovanni’s Trends owner said that the two-way traffic conversion was a factor, but Councilor Belanger expressed surprise at this in the City Council meeting; he said that conversations he had with business owners about the change had been largely positive. Indeed, it does appear that new businesses are moving in to serve a college crowd. Bishop’s Legacy Restaurant is serving food in a more to-go than sit-down setting, and Jimmy John’s, a national sandwich chain famous for their campus locations, is moving in the Giovanni’s Trends space. Coming soon, we will write about two other exciting initiatives, the development of a Downtown Business Improvement District and Downtown Business Association. Additionally, the City Manager is planning a follow-up summit with property owners in the near future. In the meantime, please let us know whether you have any other questions about DPD or downtown! There are lots of delicious lunch destinations in downtown Lowell, and it’s our civic duty to occasionally forgo the squished pbj at the desk and treat ourselves to a lunch out. Whenever we put our money where our mouth is (get it?) and go out to eat we do our part to support a vibrant, bustling Lowell. But in terms of benefit to Lowell for your sandwich buck? It’s going to be pretty hard to beat Cafe UTEC. I’m sure most people know what UTEC is, but if this is the first thing you’re hearing about it, basically, UTEC is exactly the kind of organization you hope your community has. They reach out to youth in the community, specifically targeting kids who are heading in directions that bring chaos and violence. They provide dedicated, accepting, nonjudgemental community and guidance that helps get them on the path to be productive and empowered citizens. 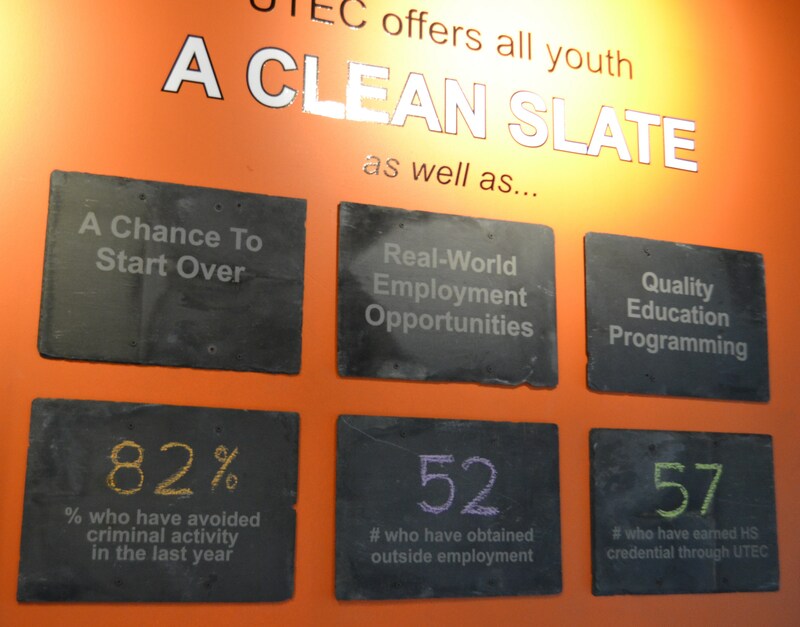 UTEC does this in many different ways, and with many different tools, but one of the biggies is their workforce development training, where they essentially have the youth work in-house, learning both job skills and the consistent habits that an employer will expect. UTEC builds furniture, does maintenance work, caters events, and now, they run a restaurant. Cafe UTEC’s bright and cheery space. Cafe UTEC would be a great place to go when you’re having a glum Monday- it has great energy. The kids that work there have a lot of warmth and enthusiasm, and there’s a steady hum of youthful chatter and bustling activity. UTEC’s culture is all about positivity, just being there puts me in a better mood. It’s a breath of fresh air in a world (and occasionally a city) that can be pretty grouchy. The food is equally fresh and energizing. Cafe fare with lots of nice lighter options, and seasonally, veggies from the community gardens of Mill City Grows. Everything I’ve had there has been flavorful and thoughtfully put together but not pretentious. Excellent vegetarian and healthy choices that don’t break the budget: $5 salads, $7 soup and sandwich combos. I’m working my way through the menu, and I’ve been happy with everything I’ve ordered so far. I’d especially recommend the eggplant panini, the grilled cheese and soup combo, and the cinnamon-spiced hot chocolate. I’m also happy to report there’s a tofu bahn mi. Chris and I have been so far been thwarted in our love of Vietnamese sandwiches here in Lowell, for whatever reason places don’t offer the tofu option that seems to be common elsewhere. 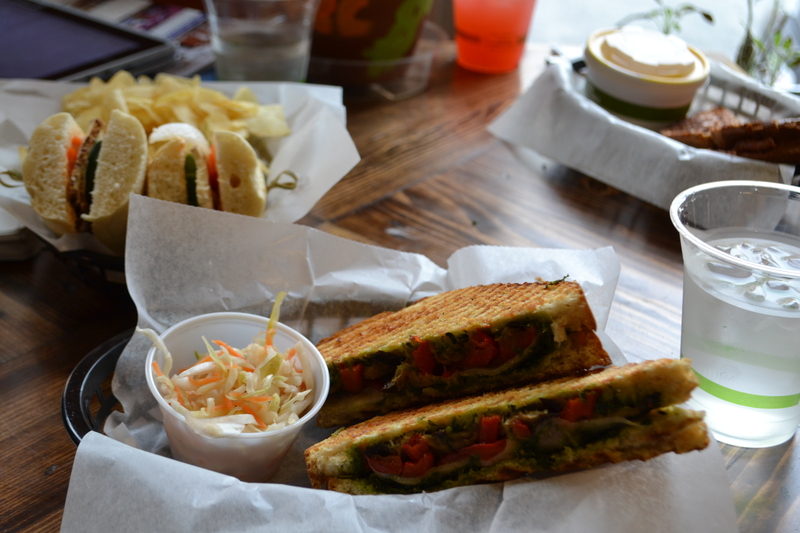 Tasty trio: Eggplant panini, bahn mi, grilled cheese with soup. All of that deliciousness is made and served by youth learning specific workforce skills and lifelong workplace habits in a supportive, caring environment. Lots of kids from difficult backgrounds want to make their lives better and build a real future. But without the skills, and with so many things working against them, it’s easier said then done. If things go wrong and you’re late to work at Dunkin’ Donuts, you get fired. If you’re late to work at UTEC, they work with you to figure out what’s getting in your way, logistically or even emotionally. That extra support is the help youth need to make real, positive changes in their lives. Eating at Cafe UTEC is a great way to support those youth and these programs, and any profits the Cafe makes will go right back into the program. 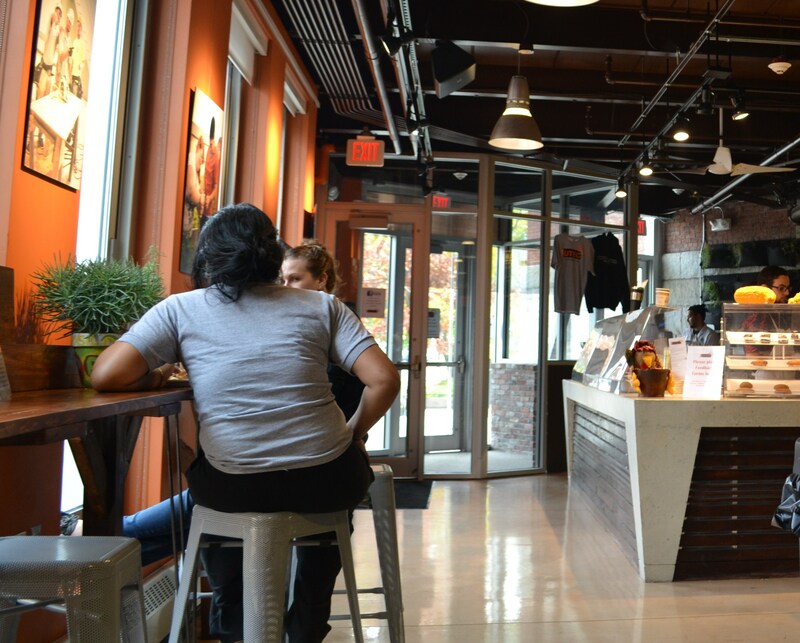 Cafe UTEC is located downtown at 41 Warren St, right across the street from the Umass Lowell Inn and Conference Center. They’re open for lunch Monday-Thursday, with occasional special dinner events. You can check their facebook here for specials and deals (on Wednesday you got a free drink if you wore something Patriots themed). If you don’t already follow UTEC’s main facebook page you totally should, I find it to be a real bright spot in my facebook feed. Finally, they have a new blog over at the Sun to add to your blogroll. UTEC’s always busy, so there’s always something new to hear about. I look forward to whatever they do next! Paul Marion’s excellent post series about Salem a few weeks ago struck a chord with me (Read it here, here, and here). Last fall, I worked in Salem as a tour guide during their busy season, and I’ve spent a lot of time pondering Salem and Lowell, two cities with a lot to offer but a big difference in tourism volume. I have a couple of thoughts about what Salem does well, and how Lowell might think about playing to its own strengths in similar ways. Experience a sophisticated cultural destination (the formidable Peabody Essex Museum, and the more upscale shopping and dining). Salem is an immersive experience. Here, a red line leads you from Witch Village to the Witch Museum and nearby B&B. These three separate but overlapping narratives bring in a critical mass of visitors and give them a clear sense of Salem as a destination. Lowell has strong narratives too! I think this is one of Lowell’s greatest strengths, and when I say that, keep in mind that I visited as a tourist before I ever considered living here. I think Lowell is really lucky in that many of its biggest draws from a tourism perspective fit into a series of stories or ideas. The most obvious is the industrial history story associated with the National Park here. Overlapping with that is the theme of textiles generally, with the National Park, the Textile Museum, and the Quilt Museum. Another strong motif is immigration and different ethnic and cultural groups, again told in the Park, and with our many unique ethnic neighborhoods and restaurants. Finally, there’s an overarching story here about revitalization, about historic preservation and a cultural turnaround. Museums could anchor a Lowell Textile Tour (Bing Maps). The day we visited Boston, we found two pamphlets for Salem but none for Merrimack Valley. Interacting with the folks on tours in Salem made it clear to me that it has figured out how to sell itself as a day trip from Boston. Salem gets tons of non-regional visitors, especially during the Halloween season. People I chatted with were often visiting Salem for the day as part of a longer trip to Boston. Lowell is just about the same distance from Boston as Salem (theoretically half an hour by car, 30-45 minutes by train), but I think we’re not reaching this market as well as we might be. One explanation for this? Salem has amazing tourism outreach. 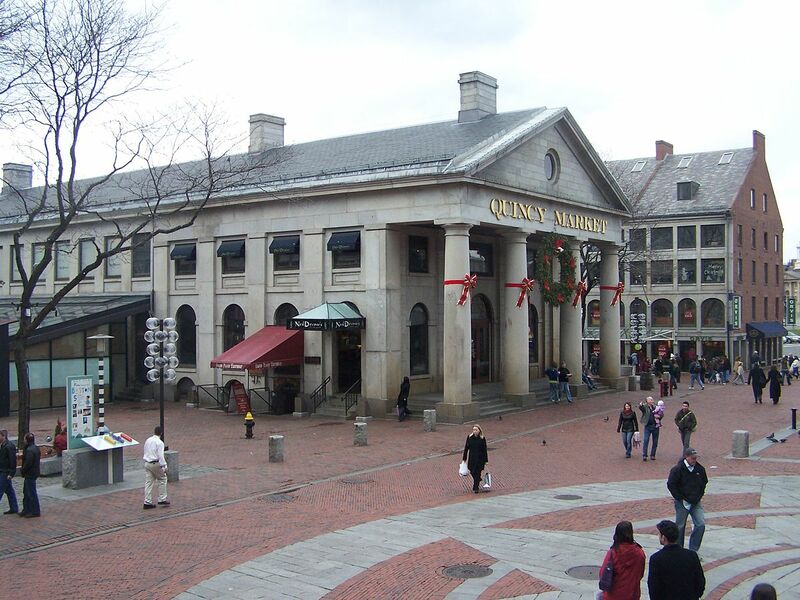 Check out this example from Faneuil Hall. Here’s one of the big card displays offering the visiting tourist a million options. See Salem? 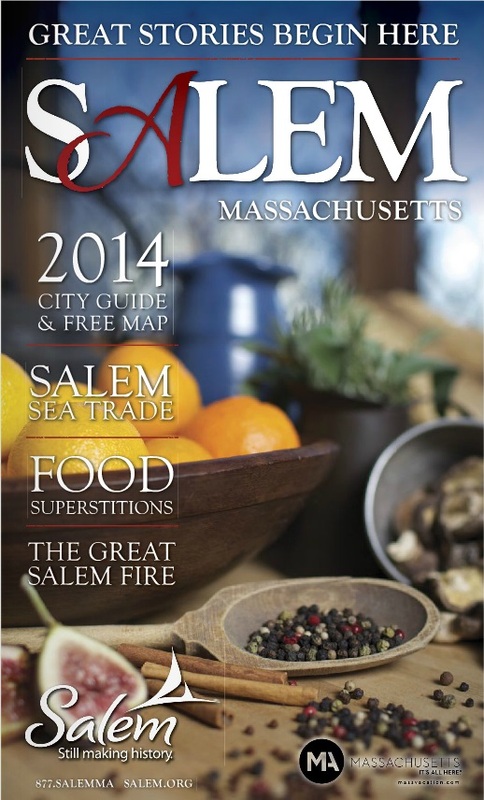 It’s there twice, in Salem’s nice glossy booklet and in House of the Seven Gables. Where’s Lowell? Nowhere. 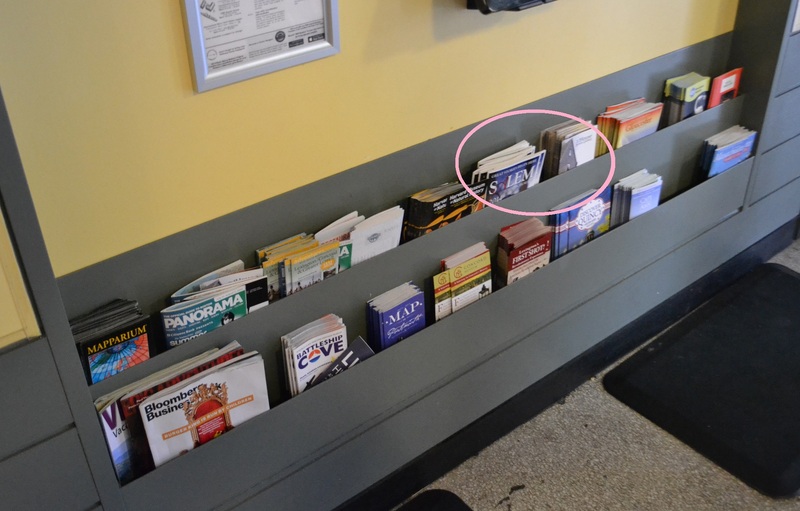 Now, sometimes I see the Merrimack Valley Convention and Visitors Bureau booklet there, which is something, but that booklet is covering a huge area, and Lowell’s just part of it. I think the unprepared tourist, trying to decide what to do with their day, is unlikely to be led to Lowell. Now why is Salem so much better at this? Some of it we can’t change. Lowell’s biggest draw is the National Park, and the National Park can’t spend money on advertising. Like literally, legally, they can’t. Salem’s National Park stuff is a smaller piece of the pie, proportionally. The mighty Peabody Essex, other historic sites, plus all those funky stores and touristy “museums” band together and spend a lot more money than Lowell can, at least right now. That doesn’t mean Lowell can’t apply its resources strategically, of course. 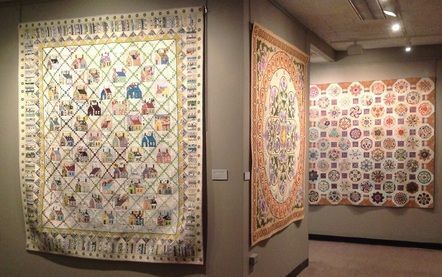 Quilts on display at NEQM. I think the biggest thing Lowell can do to try to copy the positive aspects of Salem is think about how to strengthen and play to the strong themes it has going. I get the impression Lowell does get “textile” theme tourists, for instance. How can we figure out how to make their day in Lowell a more immersive, memorable experience? I think a store that sold fabric or crafting supplies in the downtown might be a good fit there. Maybe we can figure out how to better wind in Lowell’s modern textile artists too. I notice that several of this years’ Parker Lectures are textile-themed, that’s probably a strong connection. Mill Works, contemporary fiber art recently exhibited at ATHM. Also key: more communication and collaboration between Lowell’s diverse forces, as suggested by the recent marketing meeting in June and the emergence of First Thursdays. If Lowell’s forces put their heads and their money together, they can present a stronger, more unified front. On a smaller scale, there’s something everybody excited about Lowell can do to help it. Good internet reviews and buzz are a big part of how people make their travel decisions. This is an area where Salem is running laps around us: for example, the Peabody Essex Museum has 135 Yelp reviews. The American Textile History Museum has eight. Each of us can help Lowell by taking to our favorite social media and making sure that people know about what there is to do in Lowell. Consider taking a minute and dropping some positive Tripadvisor or Yelp reviews of restaurants, stores, and cultural destinations you like. Follow and Like the cultural organizations you enjoy, and Share their pictures and announcements with your friends. I’m not suggesting any level of phony boosterism. But these things do matter, and it requires such a teeny amount of effort to support the organizations in Lowell you want to see do well. I’ve visited both Lowell and Salem as a tourist, and now I’ve guided tourists in both as well. Both are fun, vivid places, with lots to see and do (and eat). Lowell is every bit as interesting as Salem as a destination, and I often chat with tourists in Lowell who’ve had a wonderful experience visiting the city and have really felt a connection to its stories. I don’t want everything that Salem has for Lowell: some of its spooky tourism crosses the line from cheesy to downright disrespectful. Chatting with Salem locals, it was clear that too much tourism can be a curse as well as a blessing, and that sometimes the city could be a weird place to actually live. But I’m confident that Lowell could handle a little more tourism without losing its strong sense of itself. Let us know in the comments if you have thoughts on other good strategies Lowell could adopt from Salem or other potential tourism role-models. Learning Lowell Pub Crawl: Coming to a Downtown Near You! Chris and I decided we need to learn more about Lowell’s fine establishments, and what better way to do that than invite our readers on a pub crawl? This Friday, we will meet at Old Worthen and move steadily eastward, one bar an hour. Everyone is invited and welcome to join for all or part of the night to share stories and good times. We don’t know if we will have a small or large group, but either way, we know it will be fun! A couple of weeks ago, we reviewed the panelists of “Lowell Looks Ahead,” a talk show roundtable hosted by Teddy Panos of WCAP, and what the panel said about education’s role in economic development. This week, we will cover the remaining themes. Notably, this post won’t cover the show verbatim, as panelists skipped back and forth between topics. Rather, panelists’ comments are arranged by topic with my own thoughts and fact-checking interspersed. I encourage anyone interested to listen to the remarks made in context here. One important topic that won’t be covered is the Lowell High School. We’re planning a series of posts about this topic, and we will include the panel’s comments there. Jim Cook, of Lowell Plan, spoke during one segment of the show and agreed that a large department store “is not going to happen.” However, he noted that smaller start-ups funded by the Lowell Development Financial Corporation, such as the Back Page, are finding success and stability. 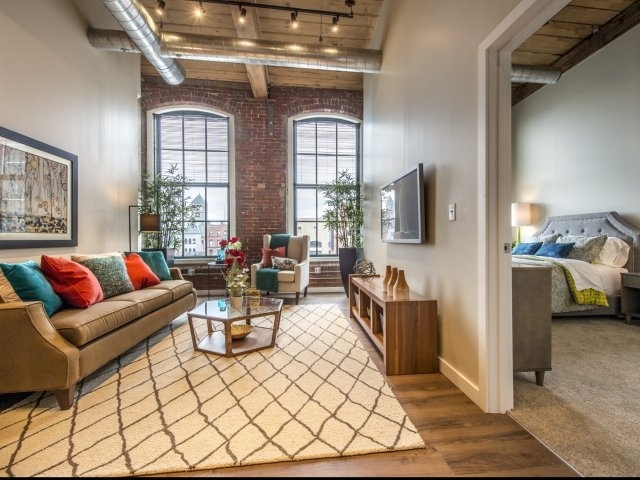 The show also included Sal Lupoli, who recently purchased the former Comfort Furniture building, a prime development site near Gallagher terminal. Mr. Lupoli explained that he negotiated for “well over” three years with the two owners, before finally reaching a deal. He now plans market-rate housing atop destination retail such as “a restaurant, a small upscale pub or small upscale environment whether they’re getting off train or bus.” He credited the state delegation for including funding in the Transportation Bond Bill for an overhead connection to the Gallagher terminal parking garage. Regardless of anything else, I believe Mr. Lupoli’s successful negotiation is impressive. Jerry Caplan is the owner of Thorndike Mill Outlet and former co-owner of the building. Mr. Lupoli said that there was a “small timeframe” for Mr. Caplan to downsize, but he hopes to keep Mr. Caplan there “for a while.” He also says that development will move slowly, so that he can work closely with the City Council and planners to “maximize” the site. Despite positive developments, the panel believes downtown vacancies are a problem. Mr. Panos said bluntly, “Our main drag is pretty barren.” Mr. Cook agreed vacancies are a concern, but argued that downtown’s vacancy rate was comparable to nearby malls’ vacancy rates, suggesting much of the turnover was related to personal reasons or larger trends and not downtown’s viability. Mr. Cook may not be far off: the 2012 overall retail vacancy rate was 7.9% in Boston’s northwest suburbs (including Greater Lowell), and Lowell’s downtown retail vacancy was 8.55% last December, but up-to-date reports are costly. Regardless, it is clear that the vacant, prominent storefronts trouble many in the city. I know of a saying in real estate: “Retail follows rooftops” (the commercial market lags the residential by up to a year.) Initial residential attraction could be related to a combination of affordability and interesting destinations. When enough of these residents move in, chains crunch the numbers and move in, in turn attracting more residents in a virtuous cycle. However, each resident supports only a limited amount of retail, regardless of their income. A “rule of thumb” is that each household can support 15 to 20 square feet of walkable retail, and I plan to do an analysis based on this rule in a future post. Mr. McCallum suggested an additional problem: as properties are turned into residences; those properties are taxed at the lower rate even though residents require more services. Research consistently shows that residences generally cost a city more than the taxes they generate, regardless of whether a split rate is used. This is a problem for every town. If converting storefronts to residences to “correct” the size of downtown is off the table, downtown must attract shoppers from out-of-town. Speaking on this, Mr. McCallum said, “If you build it, they will come.” He listed attractions and events that already attract residents, but Mr. O’Neil countered that he lives in Westford, and although his friends go to Lowell to attend a ballgame or restaurant, they “go right home” afterward. …you’ve got to change your philosophy, you’ve got to change your style of downtown. Whether it’s the Market Street or John Street garage, they’re not going to walk at night to go to a restaurant. It’s very difficult [even] for [Memorial] Auditorium, to park in the parking lot, for a woman to walk across the street. You have to go down at ten or eleven at night, and tell me if you’re going to walk alone. So, safety is a big factor for the downtown. Women going to a restaurant at night, they don’t want to go near a bar, walking home going to their car. Following this, the question may be whether Lowell is a competitive location for businesses. When asked this, the panel immediately brought up Lowell’s tax rates. Robert Caruso, CEO of Lowell Five Bank, said that Lowell Five’s property taxes rose 66% in five years and “That is not an indication it is a business-friendly environment.” He said Lowell had one of the highest commercial rates in Massachusetts, sending a “bad message.” He said Haverhill had a more competitive rate. Mr. McCallum and Mr. Behrakis agreed. They said that businesses look at the total cost of running that business, and taxes are naturally part of the cost. While Mr. McCallum compared Lowell’s taxes unfavorably to other parts of the United States such as North Carolina, Mr. Behrakis said that he owns properties in Lexington, Bedford, Haverhill, Cambridge, and Boston, and that Lowell ranks #1 in taxes. He says an “old community” like Lowell cannot compete on taxes. Mr. Panos mentioned that most city officials he’s spoken with have said that businesses “don’t look” at the tax rate, but suspects the real reason the tax rate is not changed is because it is “political suicide” to suggest a residential tax increase. He argued that it is “shortsighted thinking,” but nobody is “getting through to the elected officials,” and they show a lack of understanding of what motivates businesspeople to open businesses. I actually have to partially disagree with the panel. Studies show that although business owners often cite taxes as a primary concern in surveys, links between tax incentives and job growth are ambiguous at best. Business’s behavior shows that infrastructure, cost and skill of local labor, local supply and demand, and even ease of navigating land use regulations are more important in their decision-making. Retailers will look for customers, tech companies will look for places that skilled workers want to move, and manufacturers will look for a combination of good transportation infrastructure and low labor costs. I do believe Mr. McCallum is correct in that taxes are a consideration. However, the relative importance of taxes is different for each business type; rate is less important than overall tax bill; and tax stability is nearly as important. A developer wants confidence that when she creates a pro-forma for a property, her predictions on income and cost will both be close to correct. The taxes will then be factored into how much the developer will offer for the property. However, if there’s a worry that there will be a sudden jump in taxes, it’s much harder to determine an offer. This is not to underestimate how important efficient use of taxes is. A successful community cannot have a high tax without infrastructure, amenities, and services commensurate with that tax. This is why Marc O’Neil’s observation requires some consideration. He predicts that there will be a tax increase in this fiscal year and believes that the rate should be more balanced between residences and businesses. He suggested that the business community needs to come together as a force to ask for lower business property taxes, and that it stops “people from coming in or expanding.” I would be very interested to know which businesses may have considered Lowell if it weren’t for taxes. Is it Just an Attitude? Any entrepreneur, woman or man, that creates their business from scratch, they want to be welcome. Because as an entrepreneur, you have a lot of things you’re dealing with on a daily basis, and when it comes to the permitting process, or when it comes to building that public-private partnership, you want to be welcome… You want resources only the town offers or has has access to or has tacit knowledge of in order to be successful. I will tell you today, and it’s because of 25 years of hard work, I go into communities that want me in that community. If I knock on somebody’s door and the Town Manager or the Mayor answers the door in some respect, and it’s lukewarm, or they start to tell me about all the hurdles, and they say “no because,” instead of “yes yes,” Then you know what I do? I politely shake their hands, wish them well, and I go on to the next community that wants to take my tax money, or take the opportunity to create some kind of business in that community. And there are plenty of communities in these 350 plus towns and cities that want jobs and want tax revenue. In my experience, Mr. Lupoli’s position is common. It’s a fact that communities compete with one another. In many cases, this inspires communities to be efficient, creative, cooperative, and uncorrupt. Other times, it becomes a mere competition between states that to give the largest tax break. Regardless, Mr. Lupoli mentioned that the City of Lowell’s reception had been “nothing but positive,” mentioning that Lowell’s three representatives “have always embraced” him. Mr. Caruso said he talked to only Corey Belanger, Rodney Elliot, John Leahy, and Rita Mercier in the previous election, and was asked about the location of Lowell High School and economic development. He credited them for making time, as Lowell has many competing issues, and it is sensible that a single business manager would not be a priority. Nevertheless, he believes there is not enough political outreach. He noted public/private partnership in Lowell has been a winning strategy for many years, and that the state delegation has continued to be cooperative with business. I did find it notable that the three of the four City Councilors Mr. Caruso named have made many of the economic development-related motions in 2014, such as creating a downtown hotel initiative, downtown task force, or weighing in on the Lowell High School decision. The Lowell Plan: Is its Next Step a Shared Marketing Campaign? Mr. Caruso previously sat on the board of the Lowell Plan, and said that this was one vehicle that “at least used” to serve as a vehicle for public/private cooperation. Mr. Cook, its director, said that losing someone with “the stature of Paul Tsongas” changed the Lowell Plan’s role. He said that it now operates behind the scenes and provides a “sort of round-table” where business community and elected officials can talk about the community. Many initiatives have come out of this dialogue, such the American City Corporation 80s downtown study, partnerships with UMass Lowell and Middlesex Community College, the “There’s a Lot to Like About Lowell” marketing program, the 10-year plan for downtown, and more recently, the “Downtown Evolution” plan by Jeff Speck Associates. Mr. Cook agreed that the city needs to begin a “solid marketing program” for 2014, and believes Lowell Plan can push that initiative forward. I’ve recently learned that the Lowell Plan is being used as a model for both Lawrence and Salem. Not only does it facilitate dialogue, it plays unsung roles as well: as a private agency, it can start programs and make deals without the red tape of the federal or state governments. It can also hold private meetings, where businesspeople and city officials can be frank without worrying about political repercussions. However, this “lack of transparency” is often what many citizens critique. To me, this is a difficult balance to achieve. Backroom deals invite corruption, but too much control makes it difficult for the government to move quickly, think beyond the election cycle, or take perhaps-proven actions that nevertheless don’t fit within cookie-cutter enabling laws. Although Ms. McFadden acknowledged the problem of vacant storefronts, she focused on the positive. She shared that Little Delights is working on coordinating businesses for a shared mailing. The owners of El Potro said that their reception in Lowell was better than Somerville, and they were amazed that they were invited to a City Council meeting and that the mayor attended their opening. Why Should We Have a New Partnership? One of the suggestions that came out of the panel was for a new committee that might assist businesses and the City working together. He suggested strategizing and “bringing in consultants.” We mentioned this idea in “Quite a Task: Downtown Lowell Task Forces,” but since then, I’ve heard Mayor Elliot has been working on forming the committee. I hope he releases more information soon, as I was unable to tell from the panel why they felt existing venues did not serve their needs. Partnerships between Businesses and Residents: Do they Understand One Another? He believed Senator Elizabeth Warren, criticizing big business, is causing part of the divide. Mr. Behrakis agreed that partisan politics is creating disunity, compared to his experience decades ago. Rouse Company was famous for designing and promoting shopping centers in the 1950s, planned communities in the 1960s, and festival marketplace conversions such as Fanueil Hall in the 1970s. James Rouse also advocated for large-scale urban renewal projects. I have never seen their Lowell plan, but from the description, it included changes to make downtown more of a destination shopping area than a traditional downtown. The panel agreed that plans are made without resident input or thought to previous plans. However, to me, each effort has built upon the last, incorporating local input, goals, and ideas. Incomplete action items from older plans are often included, as they can only be executed when conditions are right—for example, a trolley expansion or a development next to Tsongas Center. However, given that an agency rarely wants to advertise “what it has left to do,” perhaps implementation could be more systematically tracked and advertised. I know I’m going to bring up a controversy, but I think the bigger mistake Lowell made, many many years ago, and I was a young man, I was proponent, but I got shot down. The [Lowell] Connector should have been going all the way into downtown Lowell, and not stopped at Gorham street, which is a disaster area. That Connector could have been the vitalization of downtown Lowell. Mr. Behrakis reasoned that people have trouble finding the Tsongas Center, and Mr. Panos mentioned Thorndike Street must serve in that capacity. This position was common fifty years ago, as property owners believed poor access and congestion was causing downtowns to fail, and opening downtowns up would lead to lucrative redevelopment projects. Unfortunately, urban cores never can have the ease of access of a suburban office park or shopping center. Highways ultimately destroyed the urban core amenities that are now attracting young people back into those cores. As a 2012 report describes, communities are actually finding success in removing, not expanding, their highways, such as Portland, Milwaukee, Toronto, and most famously, San Francisco. However, the group suggested other solutions that are smaller-scale in scope. Bob Caruso mentioned that Newburyport was a “ghost town” in the 1950s and 1960s, and recommended studying cities such as that and Portsmouth, NH, and replicating their methods. Both cities used a historic preservation approach to their downtowns. Mr. Behrakis cited Quincy’s redevelopment project as a model of success. Mr. Behrakis mentioned it was a $500 million project, but in actuality, the public-private project now totals $1.6 billion and has recently hit troubled waters as redevelopment did not move forward after demolition. The project reportedly has left part of its downtown empty for five years. 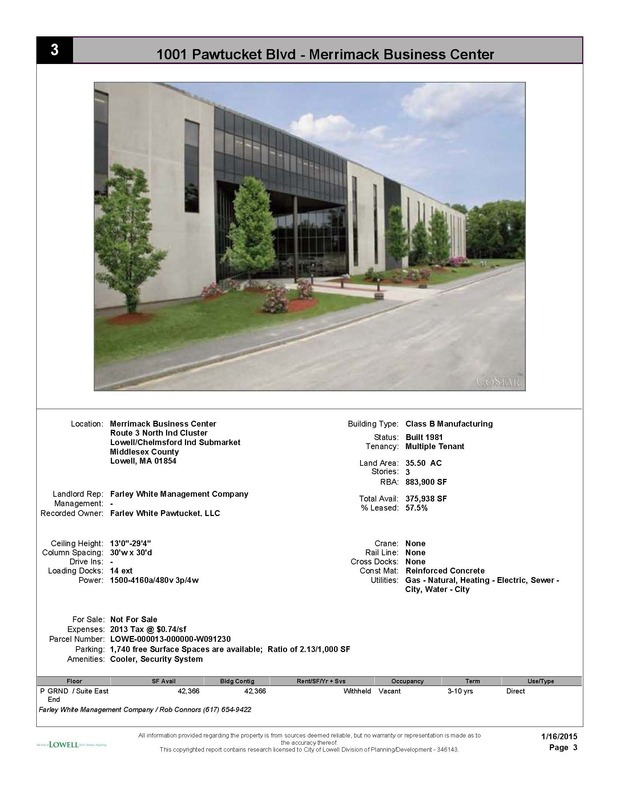 In addition to Quincy, Mr. Behrakis cited the convenience of Nashua, New Hampshire’s, behind-business parking. Mr. McCallum also praised Nashua. Although Nashua does has an attractive and successful downtown, Nashua’s own planners suggest this is due to “grassroots organizing and one small intervention after another” to undo damages of large-scale, postwar urban renewal projects. Their downtown plan states that although Main Street is thriving, it is cut off from the rest of downtown. Small efforts may be more feasible for many reasons. Mr. Caruso suggested replicating the valet parking featured in Boston’s North End. Visitors may pull up to restaurant front doors, and valets park their car in a safe location elsewhere. Mr. Caruso suggested that the valets work mostly for tips, and that Lowell Five parking lots may be used for secure after-hours parking. Mr. Cook suggested that some businesses should consider stronger marketing toward the new market-rate apartments and condominiums downtown, extending their hours to be convenient to these residents. Some on the panel took exception to this, believing that business owners closed at 5:00 pm because they saw no business after that. In actuality, I’ve seen that some restaurants, such as Centro, are actually reducing lunch hours. Does Lowell need a Visionary Leader? Mr. Behrakis believed Chancellor Meehan or others were capable and could advance economic development projects including beautification, demolition, and expanding parking. This is something I have thought about a great deal, both in Lowell and elsewhere. I’ve read solid arguments that cities succeed partly because of strong leaders, and big, somewhat risky ideas sometimes pay off in great ways. However, it seems that the cities that have best recovered from deindustrialization do hundreds of tiny things right every day. They capitalize on their unique resources and history; market these resources successfully to businesses; and create strong links both between businesses and between public and private sectors. For example, Pittsburgh found success by consistently and fairly capitalizing on development to enhance transportation and recreation while maintaining key partnerships with universities. This was sustained over the terms of multiple mayors. This is why I remain skeptical of “mega-projects.” Although Richard Florida, famous for terming “creative class,” is somewhat controversial, he has researched hundreds of cities, finding that mega-projects have not helped cities recover: “As with so many things in life, the small stuff really can make a difference to the people living in cities.” Researcher George Harbor statistically analyzed cities that formerly relied on manufacturing, and found workforce development, low cost of business, and network facilitation may be key policies. These policies don’t need a single, visionary leader, but rather an army of qualified individuals each doing their part. In any case, the panelists were optimistic about Lowell’s future. Mr. O’Neil agreed that the business community was optimistic. Mr. McCallum agreed, recalling the Lowell High School hall of fame that included Mr. Behrakis and himself, Donna McCallum, Paul Tsongas, and Jack Kerouac. He cited everything from e-commerce to big box retail. I respect how strongly these businesspeople feel about Lowell and agree that there is a positive spirit in Lowell. As always, I look forward to anyone’s comments and corrections! M. Elliott/C. Mercier – Req. City Council vote to revert Fr. Morrisette Blvd. back to a four-lane traffic through-way and remove bike lanes. A vehicle driving over the bicycle lane. This should only occur if the truck were turning. Mayor Elliott said, “We have enough traffic congestion problems, we don’t need to create any more,” and opined they were a safety hazard for motorists. 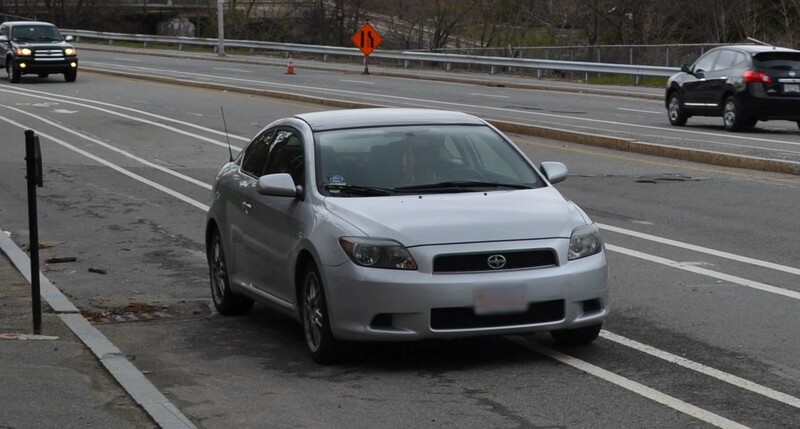 Councilor Mercier said, “Everywhere I go, people are so upset about it,” and suggested right-turning drivers may crash into a car improperly driving in a bicycle lane. She regrets prior support of the lane reduction. For me, one quote of Mayor Eliot’s stood out more than any others, “The intent should be to move vehicles in and out of the city.” Moving vehicles “in and out” is only one of many goals of a good transportation system. Not only are cities across the US embracing these other goals, but they are also getting positive results. Lowell has described its goals in community plans, and data-driven decisions may be able to assist in achieving that vision. Goals of a transportation system include the safety of all users of the system, economic vitality, promoting quality and health of life, and increasing access to destinations. The system must be economically and ecologically sustainable. It should also be just: providing for those who cannot drive. I’ve adapted these goals from the US Department of Transportation’s strategic plan. Develop, implement and identify funding to maintain a citywide Bicycle Plan that continues to build upon the existing network of bike lanes, sharrows (shared use lanes), storage racks, and signage. Even if Lowell’s only goal was moving vehicles in and out of the city, Father Morissette’s importance in this is negligible. Partly because it was originally envisioned as part of an extended Lowell Connector, it was built wider than necessary: 65’. However, it is only one of several east-west routes connecting downtown to highways. Its importance is as a piece of a redundant network, not as a major thoroughfare. Father Morissette’s role is evidenced by its relatively low average daily traffic: In 2011, approximately 9,000 cars per day near Aiken Street. For comparison, Dutton Street near Lord Overpass was approximately 32,000 average daily in 2007. Because of its low traffic, Father Morissette provided an excellent opportunity to provide additional parking to the Wannalancit Mills and Tremont Yard developments and a bicycle lane that could connect UMass Lowell’s north campus with downtown. In a February 26, 2013, City Council meeting, Adam Baacke provided data that Father Morissette was only 50-75% utilized with four lanes, and the it would be at only 80% capacity with two fewer lanes. A 2012 map by the City’s planning department shows key concern areas at river crossings, near Lowell Connector, and a few key N-S routes. This follows Federal Highway Administration research showing that a reduction of lanes for streets with under 20,000 average daily traffic does not create an increase in congestion. This is because cities usually provide a left-turn lane, letting cars waiting for a turn “get out of the way” of straight traffic. Father Morissette’s median makes providing these lanes at intersections difficult without reconstruction. Instead, right turn lanes have been provided. This increases the safety for bicycles (cars aren’t making the turn into them) but doesn’t significantly ease congestion – and may be one reason cars illegally use the bicycle lanes to pass left-turners. 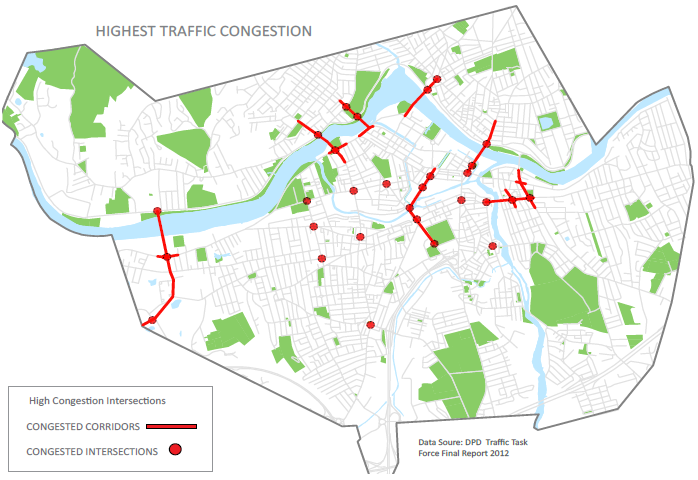 However, it appears much more likely that a lack of through-capacity does not cause Lowell’s congestion problems. Rather, intersections near Lowell’s bridges cause backups, especially along the VFW highway. To summarize, given its low traffic counts, any congestion on Father Morissette is created not by its number of lanes, but by intersection problems elsewhere in the grid. In fact, keeping the number of lanes to two may reduce difficult merging when Father Morissette turns into the two-lane Pawtucket Street. If this issue stays active, I hope to talk to the City to learn more about its traffic patterns and plans for mitigation. Speeding has been reduced. Many pedestrians and bicyclists have noted that prior to the lane reduction, Father Morissette was more like a divided highway than an urban street, and motorists treated it as such, breaking the speed limit. Crossing is now easier and safer. Two lane streets are shown to have fewer pedestrian crashes than three-lane, both because it’s a quicker cross and because there is no threat of a moving vehicle passing a vehicle that had stopped for a pedestrian. Walking along the street is more comfortable. A bicycle lane and parking provides a “buffer” between moving traffic and the sidewalk. Although pedestrians may choose other routes than Father Morissette, many choose the street for public safety reasons: it’s well-lit with plenty of “eyes on the street.” A calm street serves those pedestrians. Given these extra benefits, the discussion shouldn’t only involve bicycle and automotive safety, but also pedestrian safety and comfort. A car parked over the buffer on Father Morissette. Some argue lane design is at fault, others may argue for consistent enforcement. This week’s motion follows last week’s motion requesting a report on bicycle lane laws and fines. 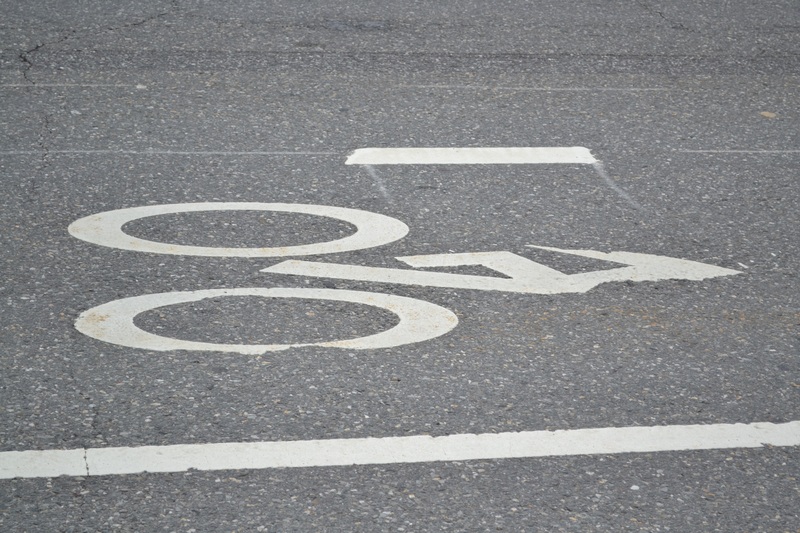 The Police Superintendent’s response states that the “recently installed bicycle lanes… have been a source of confusion for the motoring public and a source of frustration for the bicyclists that use them.” It explains that cars can only enter the bicycle lane at intersections (where the solid white line becomes dashed) or when entering/exiting a parking space. Solid lines almost always indicate a car is not supposed to cross, regardless of whether they are for bike lanes or for other purposes (for example, on highways in construction zones with no passing, the dashed white line becomes solid). This is important design language all motorists should understand. The confusion indicates a greater need for education and enforcement of traffic laws. I might speculate that the poor condition of the lane markings on Lowell’s older streets feeds general confusion about traffic laws. 2013 Lowell Bike Safety Rodeo, courtesy Lowell General Hospital. Open Street Ciclovias could complement this event. However, others have noted that bicyclists also do not follow traffic laws. A discussion on Lowell Live Feed included ideas that bicycle education and promotion could be a part of creating a bicycle-friendly Lowell. Lowell already has an annual back-to-school “bike safety rodeo,” and MassBike offers classes and workshops on urban bicycling that seem to take place in the Boston metro. Some suggested bringing back Tour de Lowell, a bicycle race for adults and children that took place in the 1990s. I love the idea of “Open Streets” events, in which one street is closed to vehicular traffic and “opened” to pedestrians, bicycles, and other non-motorized transportation. This type of event has become popular in cities around the world, including cities as large as Chicago and as small (or smaller than) Fargo, North Dakota. A less-traveled lane may be closed to bring attention to the businesses along that street, and safety and educational events may be organized around it. Typical sponsors include health organizations, cycle clubs, and business groups. Perhaps Massbike could offer technical assistance. Of course, Police officers also play a role in pedestrian and bicycle education and enforcement, and I hope to talk to the Lowell Police Department about their policies soon. Poor Design of the Bicycle Lanes? Some have complained that the bicycle lanes were designed poorly: they shouldn’t be in a place that makes bicyclists vulnerable to being hit by open car doors, they should be painted green, they shouldn’t be so wide, and many other criticisms. In this case, I looked at National Association of City Transit Official (NACTO)’s comprehensive Urban Bikeway Guide, recently adopted by Massachusetts as their bikeway design standard manual. Father Morissette has a 4’ bike lane with an approximately 2’ buffer on both sides marked by double white lines. NACTO standards for a buffered bike lane, include a minimum of 18” buffers, double white lines, treatments at intersections, and a minimum of 5’ (including buffers) to avoid doors from parked cars. It advises wider lanes when possible. The lanes fit within the NACTO standards. 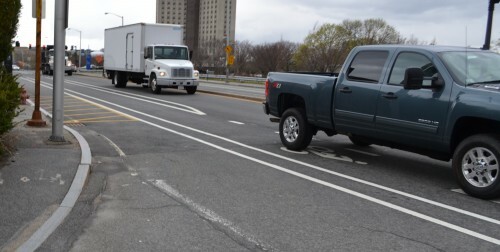 The westbound bicycle lane shifts to the median to avoid the Pawtucket Street intersection. NACTO’s standards handle this scenario, too. Nevertheless, the shift may create confusion, especially with construction in the area. There are additional optional treatments, such as green paint at each intersection (or along the entire path), diagonal strips in the buffer, or bollards separating the car traffic from bike lane. Some cities have even used the parked cars as a buffer from traffic. Any of these treatments might reduce confusion over whether the bicycle lanes are for cars. The head has worn off of this Father Morissette bicyclist already. However, each of these has an associated capital and maintenance cost. This cost must be considered against the cost of maintaining all the other lane markings in the City. In addition, the City has long-term plan to reconstruct Father Morissette, possibly with a trolley median, as outlined in the Jeff Speck Downtown Evolution plan. The parking kiosks can be reused on the new street if this happens, but expensive paint and curbing might not be. …The biggest mistake cities make is to allow themselves to effectively be designed by their director of public works. The director of public works, he or she is making decisions every single day about the width of streets, the presence of parking, the question of bike lanes. And he’s doing it in response to the complaints he’s hearing. But if you satisfy those complaints you wreck the city. A typical public works director doesn’t think about “What kind of city do we want to be?” They think about what people complain about, and it’s almost always traffic and parking. The one thing we’ve learned without any doubt, is the more room you give the car the more room they will take and that will wreck cities. Optimizing any of these practical considerations — sewers, parking, vehicle capacity — almost always makes a city less walkable. This is why it may be helpful for residents to let councilors know that they have a positive vision for the City. Click here to Contact the City Council. I suggest writing, and then registering to speak and attending the Tuesday meeting if you are able. Writing beforehand gives councilors time to think about your comments before their vote. Residents who support the plans Lowellians made together in visioning sessions must show that support. This is because complaints never go away: I have heard complaints about parking and panhandling in some amazing, vibrant, successful downtowns. These downtowns were successful because they listened and responded to the complaints, but also never stopped working toward the positive vision. If we, as a community, determine there is a traffic or (non-immediate) safety problem, instead of a quick reaction, a re-examination of bicycle plans might be in order. Boston has an excellent public plan indicating primary bike routes and appropriate treatment for each. We may decide that the City should implement a different design the next time Father Morissette is resurfaced or we may decide to add more paint to the road. Regardless, we would use good data and best practices, and we would objectively measure the results against our collective vision. 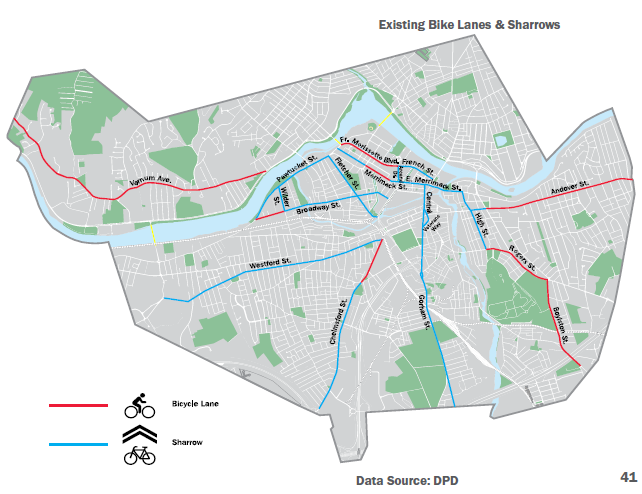 Lowell is building a bicycle network, but many bicyclists still feel unsafe. I’ve lived in Lowell just over half a year now, and some of the newness has worn off. I’ve been to many of the places now that peaked my initial curiosity, and I’m starting to know how to find what I’m looking for without having to explore. It’s so easy to get complacent, to feel like Lowell isn’t going to surprise me in quite the same way. Fortunately, whenever things start to get too comfortable, there’s a new discovery. For months now I’ve been idly wondering what the chalkboard sign that says “vegetarian” outside of Kearney Square’s Pizza and Sub Stop is referring to. I figured it was probably that they had a veggie pizza option that was popular. Nope! There’s a whole mini menu of unexpected choices. 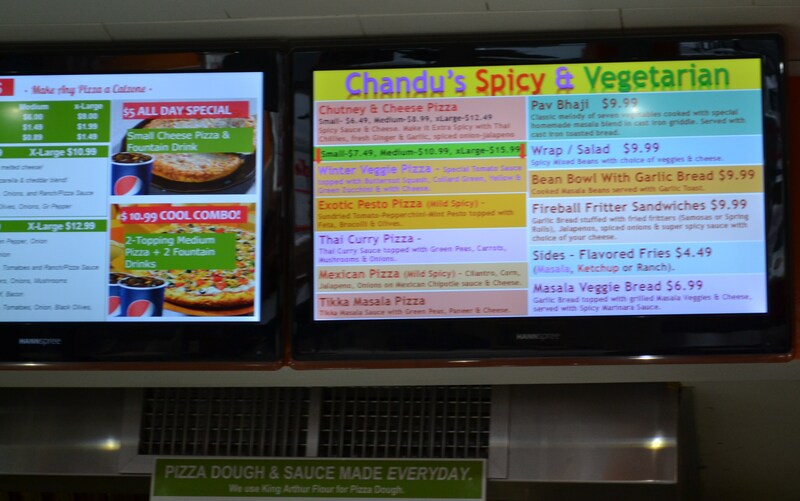 They have unusual pizza options like “Tikka Masala” and “Chutney and Cheese” and other choices that might be best described as Indian/Italian fusion, like garlic bread stuffed with samosas. 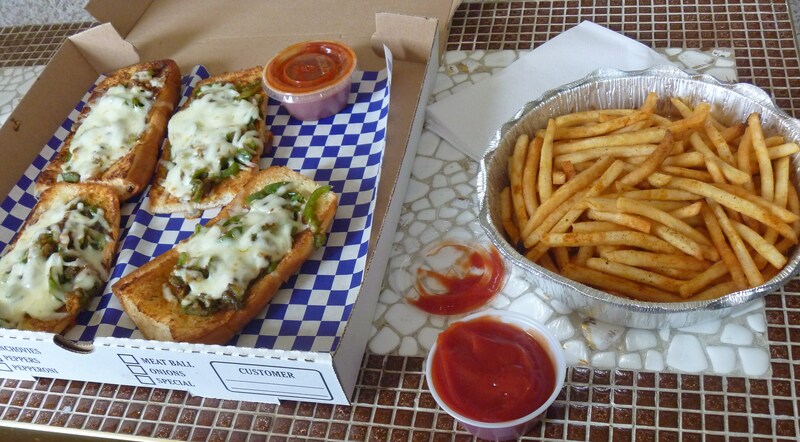 We took home masala veggie bread and masala fries, with pretty much no idea what we might end up with. It was super amazingly delicious. Savory, spicy, and a little sweet. Highly recommended for anyone looking for a little bit of Indian flavor in the downtown area. Here’s a link to their site if you’d like to see the quirky menu.